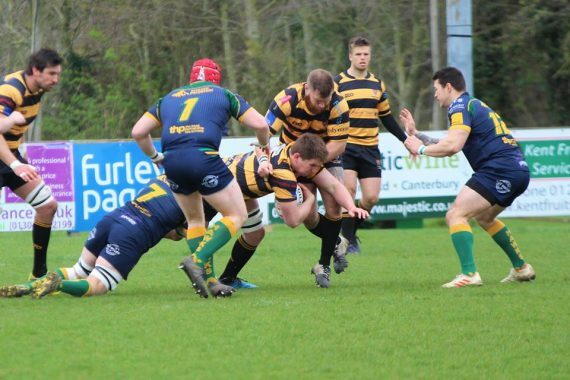 This was both a great rugby match and, for Canterbury, a revival meeting. Trailing by fourteen points at half time they staged a spectacular comeback, crowned by a winning try in the final minute of the game. 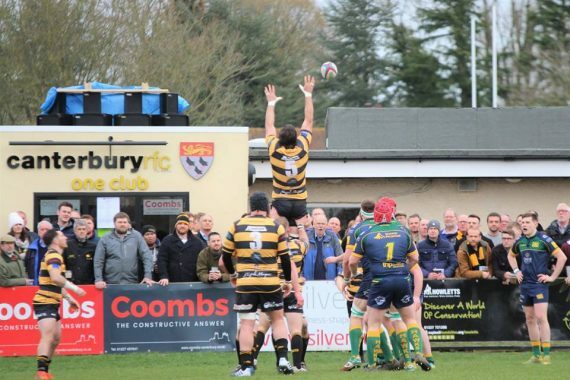 That last gasp burst by Tom Best may prove to be the most crucial score of Canterbury’s season in the battle for the National 2 South promotion play-off place. 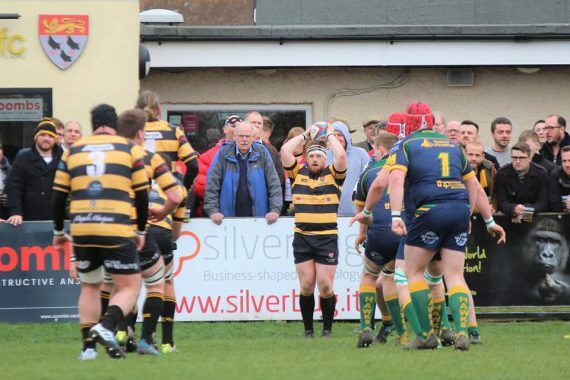 The bonus point victory moved them seven points clear of Henley and Kent rivals Tonbridge Juddians with four games left to play. To achieve it they needed some real Lazarus moments and after sleepwalking through an ill-disciplined first half they discovered them with three tries in the final quarter of the match. With so much riding on the result, big game nerves showed in the work of both sides but after Canterbury made a promising start it was the Hawks who took control. Dan Smart made a mid-field break before full back Aiden Moss stepped through the Henley defence to open the scoring but the city side were on the back foot for the rest of the half. The Hawks forwards carried with aggression and confidence and after a yellow card for Aaron Cooper they finally broke through with a try for lock Dave Hyde. Before the break the visitors tucked away two more as the penalties stacked up against Canterbury, lock Jake Albon and prop Ian Stock., plus three conversions from Ben Bolster, adding to the city side’s embarrassment. Even when Henley wing George Wood was sin binned they failed to take advantage. Three minutes into the second half a Charlie Grimes try brought a glimmer of hope. His quick thinking tap penalty caught Henley out and Harvey Young kicked his second conversion. However, Canterbury’s troubles were not over. Sam Sterling was yellow carded, Wood made a piercing run for the Hawks and two missed tackles later Bolster’s try pushed the lead to twelve points. Then came the shift in power as the city forwards began to fire on all fronts and Henley looked a tired side. One glaring scoring chance went begging after Smart had done the hard work, then a scrum pick up and drive by Number Eight Jamie Stephens lit the flame. Young could not convert but when a massive catch and drive ushered Sean Stapleton over the line the fly half was on the mark to level the scores. A draw was not good enough and as the clock ticked down a turned over ball over set up that incredible finale. The sheer determination and will power of Best, on as replacement for the injured Moss, and Young’s simple goal points repaired the frayed nerves of the season’s biggest crowd..
Canterbury: A.Moss (repl T.Best), R.Mackintosh, B.Neville, S.Sterling, C.Grimes, H.Young, D.Smart, A.Cooper (repl E.Lusher), T.King, S.Kenny, R.Cadman, M.Corker, S.Rogers (repl E.Lusher), S.Stapleton, J.Stephens. Pictures supplied by Phillipa Hilton. 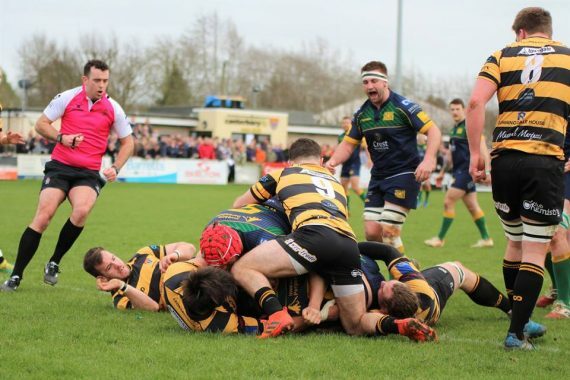 This entry was posted	on Saturday, March 23rd, 2019 at 4:45 pm	and is filed under Featured, Other Sports, Rugby. You can follow any responses to this entry through the RSS 2.0 feed. Both comments and pings are currently closed.